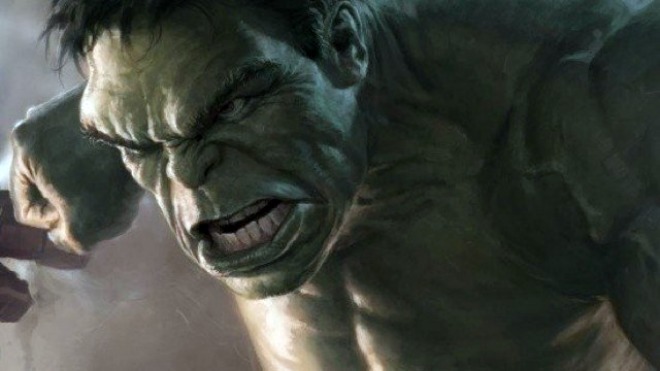 New footage from The Avengers gives New York Comic Con a better look at the Hulk. NEW YORK — Several of the Avengers assembled onstage at the New York Comic Con to premiere some brand new Hulk-centric footage! Here are the details. We’ll have a lot more amazing tidbits from the panel later on, like Agent Coulson’s version of The Avengers‘ theme song, Mark Ruffalo saying, “You wouldn’t like me when I’m angry,” and a sea of ladies swooning over Loki (seriously he’s the new hotness, you heard it here first). But first, let’s dissect that new footage for you…. A little girl runs down the street, through a nondescript Middle Eastern village and into a city. She runs upstairs into a crowded house and starts begging for help from the doctor. The camera pans to reveal Bruce Banner (Mark Ruffalo) standing over a group of very sick patients. He asks if her family has what these poor folks have as well. She says yes and holds up a fist of cash. Bruce follows her. Cut to Bruce and the little girl standing in front of a rundown shack. She runs forward, but Bruce holds her back and turns around, just as a jeep full of military personnel drives by. Bruce hides his face. In The Avengers, the role of Bruce Banner will be taken over by Mark Ruffalo. Black Widow (Scarlett Johansson) steps out from behind the shadows. “For a man who’s trying to avoid stress, you picked a hell of a place to do it.” She’s not in her usual Black Widow catsuit. Instead, she’s wearing a long dress. She introduces herself as Natasha Romanoff. Bruce looks up and Natasha has pulled her gun on him. She’s terrified. And then it’s a stand-off. Bruce tries to calm himself saying that we can do this without getting “him” involved. Slowly Natasha brings the radio up and orders everyone to stand down. Cut to an aerial shot of the hut surrounded by massive team of S.H.I.E.L.D. agents, all pointing their guns at the shack. They’re really building up the unbridled rage of the Hulk well. It killed. If anyone had any doubts about the Ruffalo casting, this scene certainly silenced any Norton loyalists. The Avengers will open in theaters on May 4, 2012.